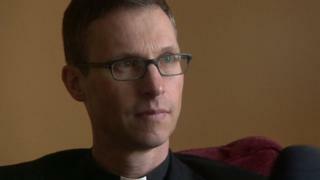 The Church of England would not have been surprised by Brexit had it still been present in the UK's most deprived areas, the Bishop of Burnley has said. Writing in the Church Times, Bishop North said the Church joined a middle-class "bandwagon of outrage and horror" in its response to Brexit. But he said it was important the Church stopped "condemning" those who voted for Brexit and listened to them. The Church said it was considering how to better serve "outer urban estates". There had been an "almighty cry of anger from a dispossessed and marginalised working class" during the vote for Brexit in June and in Donald Trump's election as US president in November, Bishop North wrote. He said both groups of people had been "routinely accused of xenophobia" when they expressed concerns about changes in their communities. In the UK, working class people had felt abandoned by organisations that were set up to represent them, such as the Labour Party and local government, he said. The Church would not have been surprised by the "revolution" in politics "this anger caused" if it had still been present in the poorest areas, he said. "But it has become so discon­nected from many of these communities that it no longer hears what they are saying, let alone amplifies their voices to the nation," he wrote. Bishop North said there were working-class communities who felt frustration towards those who were perceived to be taking "unfair advantage of the benefits system". He also said there was "intense anger" from people who, despite working hard, were still unable to feed their chil­dren. He said it was vital the Church stopped condemning people who voted for Brexit and instead listened to the reasons for their decision. But until the Church reinvested in urban ministry by "placing the best leaders in the most deprived parishes" and returned to estates it had left, those voices would "continue to go unheard", he said. "If, as Christians, we can re-engage, listen to the questions, and offer some answers, we will not just be playing our part in reunifying a nation. We may find that people also start listening afresh to the gospel that we pro­claim," he added. A Church of England spokeswoman said: "As part of its wider programme of renewal and reform, the Church of England is actively considering how to better serve those living on outer urban estates."